We got back from Dublin late last night. I have so many travel recaps to share with you but first I want to recap the Dublin Marathon. It's crazy to think this was my fifth full marathon with yesterday being the two year anniversary weekend of my first full (2013 NYC Marathon). Early in 2015, ASICS became the apparel sponsor of the Dublin Marathon which granted me the once in a lifetime opportunity to run the event. I don't feel I could ever show ASICS enough gratitude. 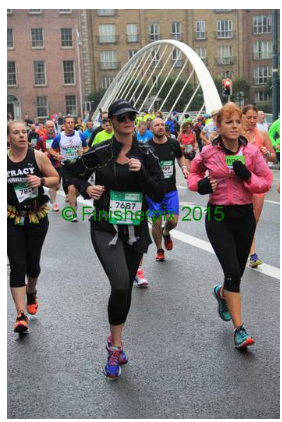 The Dublin Marathon was an entirely different experience for me which overall made me grow as a runner. I did not get near the time I was hoping for but refuse to dwell on that. Instead I will learn from mistakes I made during training and become a stronger person. I had an epiphany at some point during the 26.2 and my entire outlook on running is different. The day before the race, the group headed over to the expo. Three of us were running; myself, Emily from Rodale and Melinda from ASICS. Emily's a rockstar by the way - she was featured in Runners World for running two marathons in one week in two different countries. We quickly made our way to the ASICS booth where I purchased a Dublin Marathon coffee mug and we all got jackets. Inside our packets were some interesting items. Mayonnaise, nonalcoholic beer, a safety vest were at the top three of eyebrow raising interest. We did receive a Dublin Marathon branded portable charger (best welcome packet present ever). However, no shirt was in the packet. We learned that we receive the shirts upon crossing the finish line. I LOVE this. I know many people have different opinions on race day shirts but I am one who refuses to wear it until after I actually completed the event. It drives me bananas seeing people wearing "I Did It" shirts 3 days prior to the event. The day before the marathon, I carb-loaded all day. 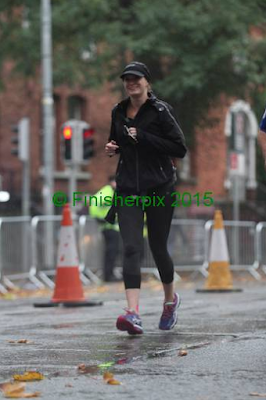 My Step-Dad's sister Leslie happened to be in Dublin with her boyfriend Tony who was also running the race. It was amazing seeing family in a different country! We went for Ramen which became my go to pre-race meal of choice in 2014. That night, we met up with the Team ASICS crew and carb-loaded as a team at a restaurant named Toscana. The restaurant was right outside of the famous Temple Bar district. We made it an early night and I had no problems falling asleep. My nerves were non-existent and the only issue I had was waking up every hour, thinking I overslept the alarm clock. The weather forecast was 100% rain and windy. Not my first rodeo with this type of weather! 1. I didn't have coffee - for over two years, I have never ran without coffee in my system. 3. NO MUSIC. I got a iphone 6S the weekend prior to leaving for Dublin. I forgot to make my marathon play list available offline on Spotify and ATT international does not work - at all. 4. I don't typically run with a Garmin and didn't think to bring one being I had no access to wifi for Map my Run. I had no idea what pace I was running. The race started and the two speedsters took off. In the first mile, I was already in my head. The first three miles were pretty much awful as nothing but negative thoughts were in my mind. That's when forced myself to snap out of it. I am in Dublin. So what if this is going to be a quiet 26.2 miles.....You're in DUBLIN. SMILE. That's more like it. Where is everyone else?! Around mile 6, I had an emotional breakdown. I passed a group of people running for Childhood Cancer and I became a blubbering mess. My 2 year old Cousin Lana lost her battle with Cancer in September. From that point forward, every time I wanted to quit, I thought of Lana and dedicated each remaining mile to her. We ran through many of the cities landmarks. We spent a great deal of time around Phoenix Park, including the Dublin Zoo. It was in the park that I realized my audible had one book downloaded on it. I started The Glitter Plan: How We Started Juicy Couture by Pamely Skaist-Levy and Gela Nash-Taylor. The water stops threw me off on this race. Instead of handing out cups of water and electrolyte drinks, they handed runners full size bottles of water and sports drinks. Going through water stations was like a water bottle war-zone since people were taking one sip out of their bottle and throwing it. Knowing ahead of time that they had fewer water stops than I am accustom to, I brought my water belt. Smartest idea ever. This time of year in Dublin was gorgeous. The leaves were changing but it was still very green. The contrast of colors were almost blinding at times. Everyone told me that this was a flat course. Not so much. While it wasn't the hilliest course I have ran, there were absolutely some inclines. It was surreal running through certain parts of this course. The history, the buildings, the landscape....absolutely gorgeous. There's a castle back there, I promise. There were quite a few runners dressed up. I saw people in minion costumes, clowns (gah) and more. My favorite had to be the guy dressed up as Marty McFly in a Delorean. You win Mr.
See all the water bottles? Around mile 10, I was over that book. I had switched to doing Galloway's run/walk method and was maintaining what I thought to be a good pace but I had no concept and wished for my Garmin. This is when I ran into another American named Jennifer who had just finished the Twin Cities Marathon two weeks prior. She was hurting and I needed someone to help make this race go by faster. Jennifer and I made quick friends. We made each other laugh, pushed each other when we wanted to quit. Two strangers quickly became each others support system. It was raining and being I had no music, I had no reason for my phone to be out. I didn't take any photos for the rest of the race. Plus the second half of the race was very residential and there wasn't a ton to look at. We did make frequent jokes about stopping at a pub for a pint. During the last half of the race, I saw two people running with Gasparilla shirts. For those not familiar with Gasparilla, it's a large Tampa based race that happens in February. I stopped both, one was from Orlando. The other was from Tampa and lives 2 miles from me. Here I am in a foreign country and finding people in walking distance from my house. At mile 23 Jennifer decided to run the last three miles in. With all the walking we did, my body wasn't having that so I maintained 1/1 Galloway Splits. Steve, the runner from Tampa and I finished the race together and just like that, 26.2 miles is over. Time to celebrate! What I learned from my first international race: Expect the unexpected and double check everything. Have a backup for your backup plan. Don't assume anything and be sure you have what you need in order for race day. Bring zip-lock bags for your snacks, phones, etc. Have a Marathon recovery kit on hand. While there were pharmacy's on nearly every corner, they don't have the same products that the US carries. I was thankful to have my Advil PM for the night after the race. Remember where you are. If you start getting negative, embrace your surroundings. It was truly a once in a lifetime experience. I cannot thank ASICS enough. Not only did I get to run my first international race through a really amazing place, my husband and I fell in love with Ireland and are currently trying to figure out how to win the power ball so we can retire early and move there. #agirlcandream. My hotel was right next to Phoenix Park when I went to Dublin for St. Paddy's Day this year. I went running there every day (I brought my GPS watch and two iPod backups for my phone lol). 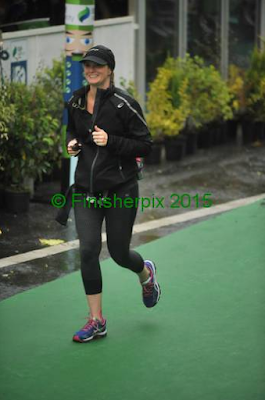 I've been eyeing the Dublin Marathon ever since and would love an excuse to go back! I'm sorry about all of your technical difficulty. How was the course over all though? Would you do it again? Thanks! That's amazing!! The course was great in the first half and got a little boring towards the end (when we went through residential). However, if you love Ireland, especially Dublin, I would strongly suggest using this as an excuse to go back. I probably wouldn't run it again since I have a list of other international races I want to do (Barcelona, London, Tokoyo, Florence, Paris to name a few!) but I never say never. I was thinking of the race this morning and wondered if I could find you here on the interweb. I must have chosen the right algorithm because Google found you first! I hope you are well. I was ever so thankful to find a warm and funny friend on the course that cold and windy day. I hope you are doing well and please come run the Twin Cities Marathon with me one day. You made the Dublin Marathon more memorable and much less painful Megan! Slainte!